how to use DS1307 with LCD16x2 library? Hello. Just load the uint8_t outputs from the ds1307_getdate function to you LCD library. You should use the sprintf or the itoa function to build the output buffer to send to the LCD library. this code works with ATmega328? this code works with ATmega16 ? Hello, I've never try it on an ATmega16, but it should work. It works for Atmega16 as well. Nice one Davide! thank you for the great library. Why do you calculate the dayofweek? I think the register 0x03 is for the dayofweek (0-7)? Could you please explain, why you do this way, please? Hello, i get the day of week to set the date. You can find the ds1307_getdayofweek call in the ds1307_setdate function. thank you for your answer, but I think it is a misunderstanding. I am a newbe, and I do not know, if my opinion is wrong. I think, the ds1307 calculates the day of week, because the datasheet says, that there is a register for it. 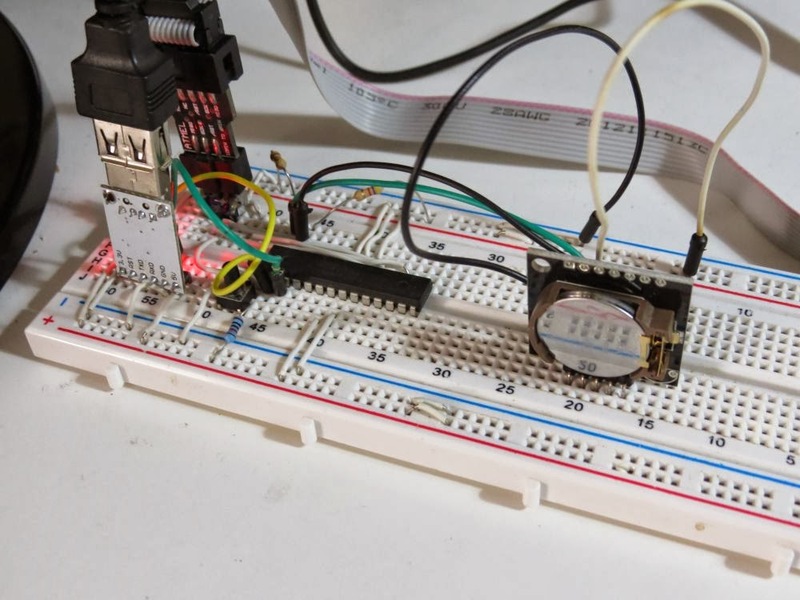 Your code reads only year, month, day, hour, minute and second from the ds1307 via I2C. And the function getdayofweek() calculates with y, m, d the day of week. So why do you calculate the day of week in the microcontroller and do not use the ds1307 for it? I write that register during the setdate because I suppose it was incremented by the DS1307, but not computed. As datasheet states: "The day-of-week register increments at midnight. Values that correspond to the day of week are user-defined but must be sequential". My guess is that ds1307 does not know what is the initial value. But now you make me suspect that the 0x03 register is written by the DS1307. Can you test if is written by DS1307 or is just incremented by an initial value set by user? I'm actually fully involved in other project and can not test this. Thank you for your constructive comment. bisakan you please tell me? Hello, it could be a file format setting. Hello, you can find the code for this library above on this blog post. It should works on ATmega328, just update the uart library with the newer P.Fleury one. How do you do to set the time through uart (I mean sending uint8_t via RealTerm)? Actually, I would like to know how to get a string from uart instead of a single char. Hello and thank you. The sample in this page does not implement an update time over UART protocol. You have to write your own protocol. I would use uart_getc and uart_gets. You can as example send a 0x55 character followed by 6 byte + 0x10 as ending, the 6 byte you send should be year, month, day, hour, minute, seconds. Reading that on your micro, parsing that out and setting time using ds1307_setdate function. Hope this helps. Hello, for the LCD library I suggest the P.Fleury one, for the keypad, you should build your own keypad matrix, I've a litte library for doing that, if needed i can post it. esta biblioteca funciona en atmel studio? Please correct your library in file uart.c. Your missing in position 154.